On 2 January 1947, a number of brethren representing 32 families from the North Abbotsford Mennonite Brethren Church (now Clearbrook MB) began holding meetings concerning the possibility of forming a new church. Their desire was to fellowship in their own community. Most of these families lived west of Abbotsford in the Aldergrove and Mount Lehman areas. By February 1947, a decision was made to purchase 5 acres on the corner of Ross and Sinclair in order to build a sanctuary, to be known as East Aldergrove Mennonite Brethren (MB) Church (now Ross Road Community Church). Almost all of the charter members lived on farms where they raised dairy cattle, chickens and also cultivated raspberries and strawberries. The majority had little money, since 65 cents an hour was considered a fair wage. In faith, they bought the land for $1,500 (5 acres) and with John Buehler as supervisor, and then spent a further $3,000 to build the basement that was then covered with roofing material. A wood furnace provided heat and simple benches the seating. The congregation organized itself as an independent congregation on 13 June 1947 with 93 charter members, and worship services started on 15 June of that year. The church joined the British Columbia Conference of Mennonite Brethren Churches in 1947. 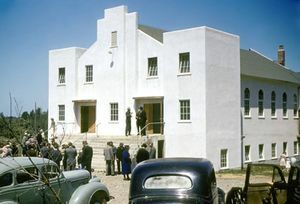 Two years later, on 18 April 1949, the building was dedicated at a cost of $13,000. As the congregation grew the building was expanded. In 1970 an education wing was built for $25,000. The church continued to grow and in 1977 a multipurpose building for $149,115.91 was constructed. By 1981 it was necessary to demolish & rebuild the main sanctuary. Finally in 1991 a new kitchen & education wing were built at a cost of $169,000. Not only did the church building change but what went on the inside as well. East Aldergrove services were originally held only in German. In 1959 the transition to dual English and German services began. By the late 1960s the services were entirely in English. In the mid-1980s a gradual change began from a more traditional style service to contemporary style music. 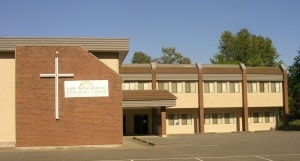 In 2000 East Aldergrove changed its name to Ross Road Community Church. Ross Road has also been involved in church planting over the years. In 1951 East Aldergrove assumed responsibility for a Sunday school ministry in the County Line area which eventually grew into an independent church, County Line Gospel Chapel, in 1958. In 2010 the congregation had a membership of 379 with an average attendance of 439. "1947-1997 Fifty Years of God’s Faithfulness." East Aldergrove MB Church. Canadian Mennonite (24 November 1961): 25. Klassen, A. J., ed. The Church in the Heart of the Valley: 1892-1992. Abbotsford, BC: Abbotsford-Matsqui Ministerial Association, 1992: 99-100. Mennonite Brethren Herald (28 August 1987): 24; (27 May 1988): 24. Voth, J. C. "A Brief History of the East Aldergrove MB Church from its Beginnings to its 25th Anniversary Celebrations, June 11, 1972." 1972, 3 pp. Centre for Mennonite Brethren Studies. Klager, Andrew. "Ross Road Community Church (Abbotsford, British Columbia, Canada)." Global Anabaptist Mennonite Encyclopedia Online. March 2011. Web. 25 Apr 2019. http://gameo.org/index.php?title=Ross_Road_Community_Church_(Abbotsford,_British_Columbia,_Canada)&oldid=155880. Klager, Andrew. (March 2011). Ross Road Community Church (Abbotsford, British Columbia, Canada). Global Anabaptist Mennonite Encyclopedia Online. Retrieved 25 April 2019, from http://gameo.org/index.php?title=Ross_Road_Community_Church_(Abbotsford,_British_Columbia,_Canada)&oldid=155880.